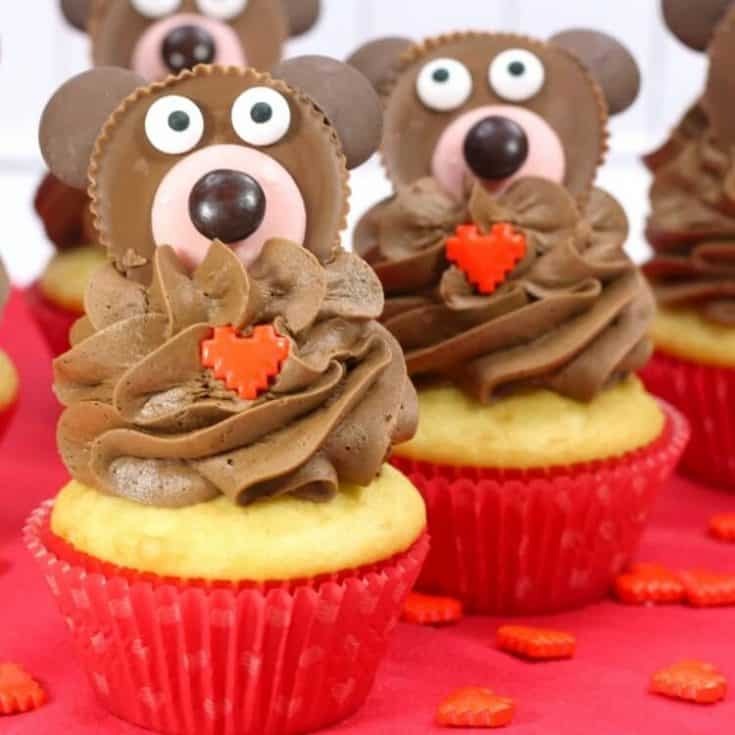 These adorable teddy bear cupcakes are perfect for that special someone. Let’s get started making this cute and easy sweet treat! Sometimes, a sweet treat made for someone (or the someones) you love is bucket-filling. 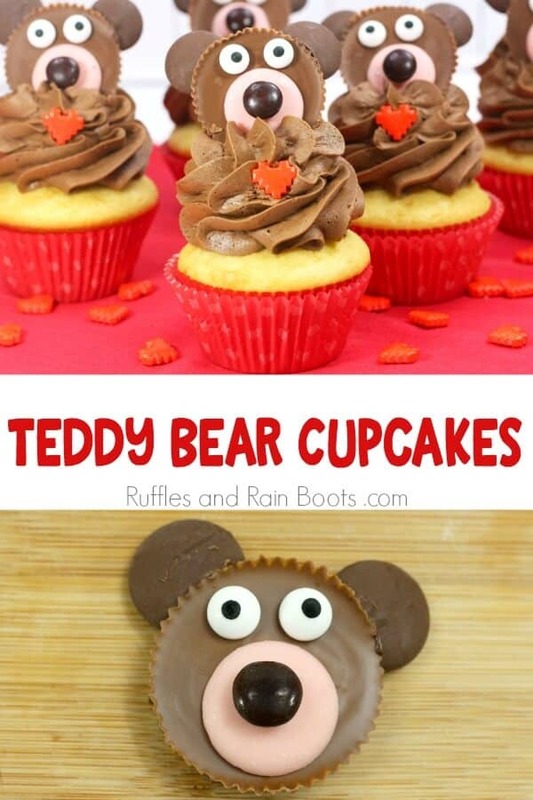 Here at Ruffles and Rain Boots, we like easy recipes busy people will make, so we’re sharing these adorable teddy bear cupcakes! With a couple of helpers, you don’t have to be a cupcake decorating master to make this cute cupcake idea. 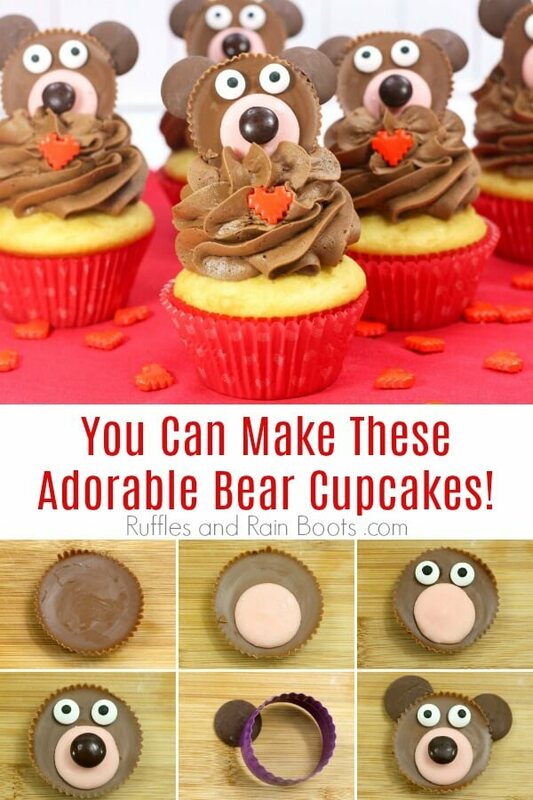 These sweet bear cupcakes are perfect for a Valentine’s Day treat, a Reese’s Peanut But Cup lover, or even when you have a serious chocolate craving. And don’t forget to check out all of our Valentine’s Day cupcake recipes here. This recipe makes 22 finished cupcakes. If you need less, half the recipe for everything except our quick and easy vanilla cupcake recipe. Use a stand mixer if you have it. If not, a hand mixer will do nicely. If you’re making these teddy bear cupcakes with the kids, make the Reese’s Peanut Butter Cup bear decorations the day before. That way, they won’t lose interest. As mentioned above, I recommend making these in advance. That way, when the cupcakes are baking and cooling, you can frost the cupcakes and quickly add the bears. 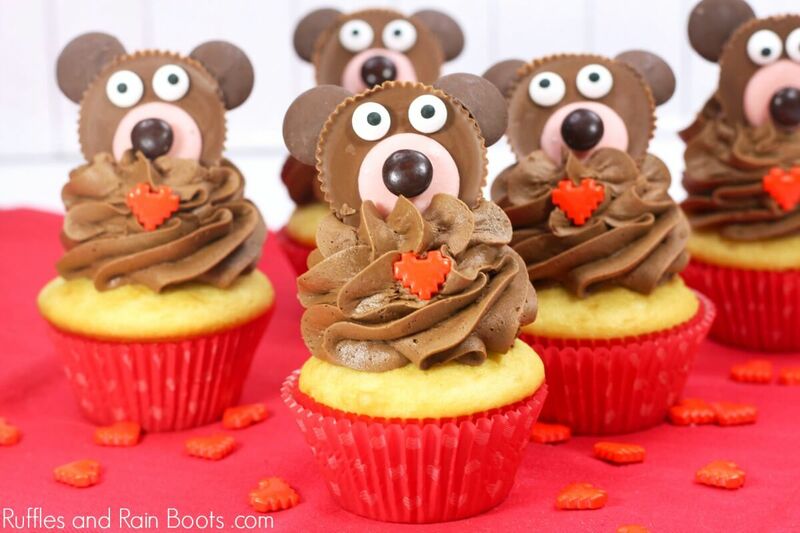 These adorable teddy bear cupcakes are so much fun to make and eat! Made with a vanilla cupcake and rich, chocolate frosting, these cuties are a tasty treat. First, make the teddy bear cupcake decorations. Place 44 chocolate wafers on a cutting board and set aside. Measure out 1 cup of wafers from the remaining. Melt 1 cup of wafers in 30-second increments until smooth. Transfer to a piping bag. 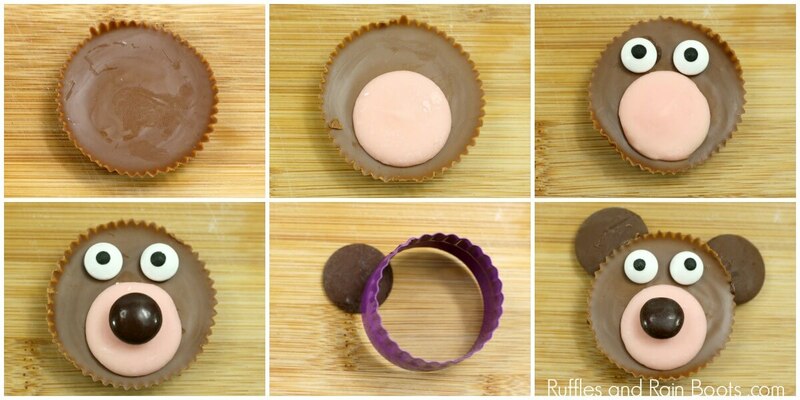 Start with an unwrapped Reese's peanut butter cup and add a small bit of melted chocolate onto the lower center of the peanut butter cup. Place a pink wafer onto the chocolate, forming the muzzle of the bear. Place two drops of melted chocolate above the pink wafer for the eyes. Add the candy eyes. Pipe a small bit of chocolate onto the "M" side of an M&M and place it onto the center of the pink wafer. Use the small cookie cutter to cut out a half-shaped moon from the bottom of all of the chocolate wafers. Pipe a line of melted chocolate onto the bottom curve of each wafer and place them onto the peanut butter cup for ears (just left and right of center). Repeat for all teddy bear cupcakes needed. Allow each to dry for 10-minutes before placing onto the cupcakes or make the day before. Next, make the vanilla cupcakes. You can use a store-bought mix, your own recipe, or our Lazy's Girl's Easy Vanilla Cupcake Recipe linked above (double the recipe). Let cool completely. Now it's time to make the chocolate frosting. Using a stand mixer if you have it, beat together the butter, powdered sugar, cocoa, vanilla extract, and heavy whipping cream until stiff peaks form. Cupcake frosting should be stiff, so only add 3 tablespoons of cream to start. Transfer to the piping bag with star tip. Finally, let's assemble our teddy bear cupcakes. Once the cupcakes are cool, frost them by building a large swirl with the star tip. Place a small mound of frosting in the center of the cupcake. Start piping at the edge of the cake, following the shape and lifting slightly as you go. Place one teddy bear decoration into the frosting and push down lightly. Add a heart to the frosting below the teddy bear.